The Health Passport is a booklet in which people record the results of different medical tests and screening procedures they have undergone. It also educates the reader about what each test or screening involves, what medical conditions it assesses, and how to interpret their scores. 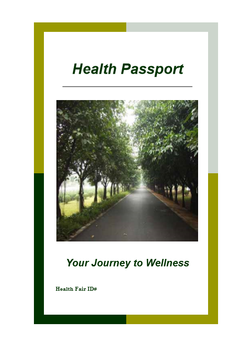 While the Passport was designed to be used at health fairs, it also can serve as a brief portable health record, containing information relevant to medical and behavioral health disorders that commonly occur among people living with mental health challenges. Other uses are as a health education tool in clinics and other outpatient programs. This document provides an easy way for individuals to track and share their health information with those who are coordinating care. The Passport can be used by people who are interested in tracking their medical information or learning about commonly assessed health risks. It also is recommended for use by service providers and others who want to educate someone about the featured tests and what they measure. This 12-page booklet includes a section for a number of common health tests or assessments, including: body mass index; cholesterol and triglycerides; blood glucose through glycated hemoglobin; blood pressure; risk for alcohol and substance dependence; nicotine dependence; and Framingham heart health assessment. Each section provides the name of the test or assessment, describes what it measures, explains how to interpret scores, and provides a space for the user’s result to be recorded. Also provided are links to web sites containing health information, a page to record additional test results, and 5 simple suggestions for lifestyle behaviors that promote better health. Anyone can pick up and use the Health Passport. No preparation is needed when using the Passport at an annual medical exam or for educational purposes. To use the Health Passport in a health fair, refer to the manual, Promoting Wellness for People in Mental Health Recovery: A Step-by-Step Guide to Planning and Conducting a Successful Health Fair, which is available as part of the UIC Solutions Suite.